There’s a new perk up at the OMGWTFBIBLE Indiegogo! 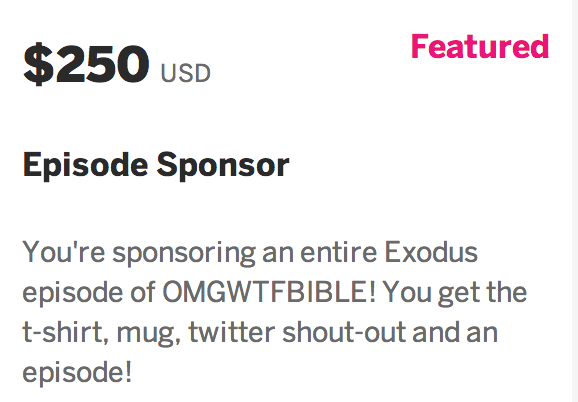 Now, if you donate $250 or more, you can be the official sponsor for an entire Exodus episode! That means you get a mug, a T-shirt, and you get an episode dedicated to you. Your name will be plastered all over it, you’ll get to chat with me for 30 minutes over Skype (or phone) beforehand, and you’ll get the official script used on stage. But hurry! There are only 11 of this perk available! This entry was posted in Announcements and tagged atheist, bible, christian, donate, faith, indiegogo, jew, jewish, omg, omg podcast, omgwtfbible, religion, tanakh, torah, wtf, wtf podcast by omgwtfbible. Bookmark the permalink.